What’s the best entry in Wikipedia? My home planet is destroyed and I am floating through space on an alien spaceship. What should I do? What’s the easiest way to feel happier? When you start using Awario, you will face Project, a really “tough guy”. This thing handles all the vital components for your successful mission such as your brand mentions, competitors and and leads. And to pass it we should complete 3 fields: Brand name, Product description and Competitors. Note: at least one of the fields within the form must be filled out before you can submit the form. This field requires the name of your brand or product. It is rather hungry and you can feed multiple keywords to this field. Just do not forget to hit Enter after each one. 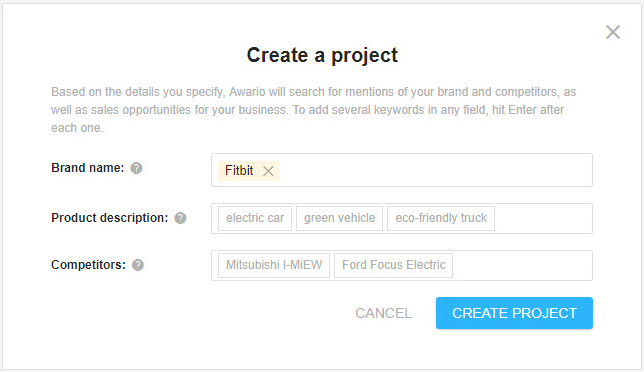 Awario will create a mention alert using the keywords you specify here. The mention alert as well as the project will be named in honor of the first keyword. But you can rename them at any time later. The second field opens the door to the world of your sales opportunities. In product description you need to add two- to three-word descriptions of what your product is. Awario will build the yellow brick road in lead generation using its magic algorithm and predictive insights. You should specify here the keywords which your potential clients would really use. E.g. you can describe Fitbit as a “wireless-enabled wearable technology device”. But it looks weird, doesn’t it? 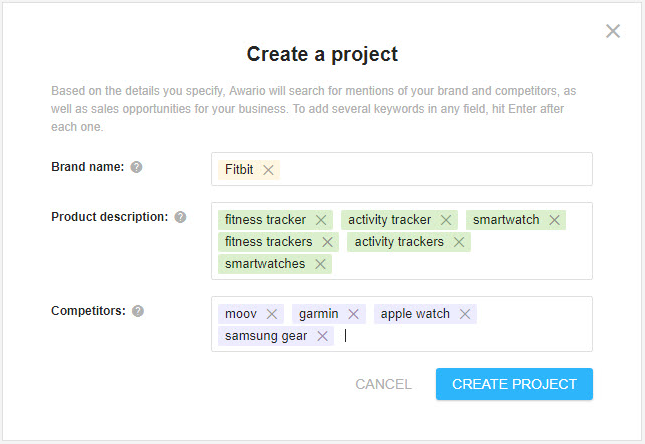 More likely they will look for “fitness tracker”, “activity tracker” or “smartwatch”. Attention: use keywords in singular and plural forms to include all combinations and thus expand the legion of prospects. Leads allows you to reach those people who are looking for recommendations about a product like yours. 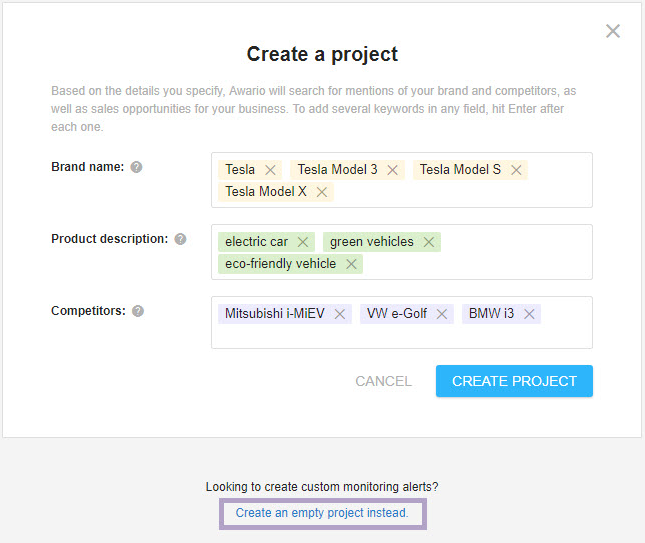 "Keep your friends close and your enemies closer" - add here the brand names of your main competitors to monitor their social activities and build the right strategy. Be always flexible and ready for action. 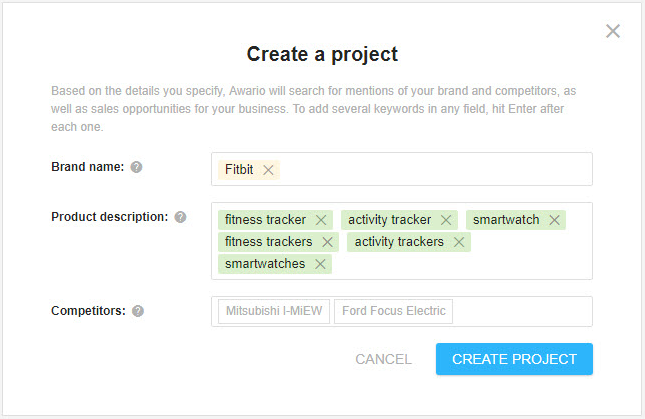 Awario will create a separate mention alert for each of your competitor’s brand or product. By the way, you can rule the destiny on your own and create custom monitoring alerts. Click on the option in the bottom of the screen.